Kiama had a number of Orange lodges, the 5th one formed in Australia after they were no longer illegal in 1845. List of Kiama District Lodges (not just Orange but Oddfellows, Buffaloes and Freemason )from Dr Bob James of the Fraternal Studies Centre in Newcastle. You only have to read the obituaries of prominent citizens of Kiama, and you realise how many and how strong these orders were, Kiama even had a lodge of the Foresters and the Grand United Order of Gardeners! Also the Royal Antediluvian Order of Buffaloes, the Knights of Labor and Catholic orders such as the Knights of the Southern Cross and fraternal health benefits societies such as the Ancient Order of Hibernians. In addition there would have been Orange Lodges at Gerringong and Jamberoo, and other centres locally as well. What were the Orange Lodges ? A pro-British lodge (based in Northern Ireland but Scottish and other national lodges existed) movement modelled on Freemasonry which was anti–Catholic. In Australia it seems to have been a milder British defence league (though violence occured between Orangemen and Catholics in Australia and elsewhere) except for the famous ‘Kiama Ghost ‘ speech of Henry Parkes, member for Kiama, but clearly the Orangemen in Kiama were heavily involved in the local militia and local Kiama politics. Henry Parkes, as member for Kiama, made a inflammatory speech at Kiama, ablely re-enacted by the Kiama and District Historical Society and for sale as a DVD at the Pilot’s Cottage. It captures the flavour of a speech which blamed the attempted assassination of the Duke of Edinburgh at Clontcarf, NSW in 1868 on a Fenian conspiracy, and not on a lone disturbed individual, Henry James O’Farrell (who was quickly hung for it). This speech was blatently opposed to the facts in the case, but helped spur a tripling of membership in Orange Lodges in the next few years. It also had a follow-up local incident where someone took a shot at prominent local Orangeman, ‘Loyal’ John Gray of Loyal Valley. The detail given said it was after threatening letters were sent for hosting the Orange Lodge meeting at his house, only the horse rearing prevented him being shot, and it was so close the powder burnt his face. Captain Samuel Charles, local landowner and future MLA, had three of his Irish labourers charged with this attempted murder of a local landlord, in the grand old ‘Ribbonman’ style of Ireland. May 12th, 1868 in a NZ newspaper (Grey River Argus). A descendant of Captain Samuel Charles, who is writing a history of this prominent Kiama pioneer has suggested that the evidence in the trial was a put up job, both the shot fired and the threatening letters were faked. Though John Gray’s house burned down on Jan 15th, 1869, and in the inquest in clearly felt it was Fenian revenge. I would argue that Henry Parkes was supported by the local Kiama Orangemen,and Samuel Charles was supported by the more moderate Freemason Protestants. Here is a more specific look inside the rituals, and critical of their movment. but explains the roles of the Black Preceptories and the Purplemen (the Kiama Orange were Purplemen) very well. 1 Minute book. 18 January 1886 – March 1920. 2 Treasurer’s Account Book. 1877 – 1883. 3 Correspondence. 1879-1884, 1907, 1917-1924. 5 The Watchman: the weekly gazette of Pitt Street Congregational Church. – vol, no.20, 15 June 1895. 6 By-laws of no. 115 Loyal Orange Lodge Geeerringong – Kiama: Joseph Weston pr, 1881. – 4p. Oddly, the historically important Purple charter is not listed! 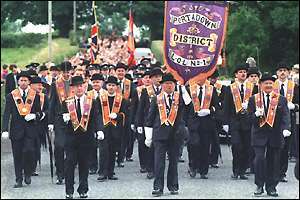 Orangemen marching in Northern Ireland (Londonderry)recently. Most Kiama residents know of the Freemasons’ Temple in Hindmarsh Park, but do they know of the role of the Orange Lodges and the OddFellows, who were a mutual friendly society, and the Temperance movements, which were against the drinking of alcohol. The current Kiama Leagues Club is built on the site of the Kiama Oddfellows (the Grand United Order provided health benefits for its members) Hall, and the original cellars, which were used for meetings of the lodges, still exist. The Freemason Hall was bought from the Sons and Daughters of Temperance, for a fifth of what they originally offered, who used to put down a roller-skating rink in the hall in the 19th Century. Certainly it is much more dignified there with much more modern thinking these days. The Orange Lodges were fervently pro-Empire and anti-Catholic and Kiama was the home of the start of Freemasonry and the Orange movement in NSW, with Dr Tarrant of Kiama as the first Grand Master of the NSW Freemasons, and Robert Barr, the first Grand Master of Orange for NSW, worked as a printer at the Kiama Independent, starting the first Orange Lodge in NSW. It is fascinating to me that in fact there were two inner societies with the Orangemen, the Black Preceptories, who keep the lodges on the right path and had a lot of knightly titles and the breakaway Purplemen, who were more reactionary. It is clear that nearly all members around Kiama were in fact secret Purplemen (this is in fact borne out by the original minute book of the Gerringong True Blues who only referred to the Order of the Arch Purple in their minutes as ‘A.P.’) and Kiama was mainly settled by Northern Irish Protestants, and as such Orange Lodges and Freemasony was rife in the area, It is arguable that British military service (we had a number of Waterloo veterans settle in the region) and membership of the Orange movement was a major criterion in assisting their migration. There is strong evidence that the 24 laborers employed to clear James Robb’s Riversdale were in fact ALL related, and constitute a ‘clan’ migration. Certainly many of the Ulster villages, especially in Fermanagh, Antrim and Armagh that Kiama residents are descended from are strong areas of Orange even today. The Kiama (Tory’s) Hotel was originally known as the Fermanagh Hotel, and the movie house down on Surf Beach (now demolished) was known as the Antrim Theatre. Kiama had, according to Richard Reed in ‘History of the Irish in Australia’ had the best example of ‘chain migration’ in Australia, who were Northern Irish Protestants. He features a membership ticket for the Gerringong True Blues as his entire inside back cover. It is clear that the fraternal societies (especially the Oddfellows, the Oddfellows Hall, which could seat a thousand, was on the site of the current Kiama Leagues Club), and the Temperance movement (mainly the Sons and Daughters of Temperance but also the Independent Order of Recharbites which still operate nursing homes in Victoria, wearing the Blue, rather than the Orange or the Green) were important as well. The role of private welfare, a community banding together for mutual survival was the answer to many problems. Private welfare played the role that public welfare plays today, as shown by the private, local free ( a shilling a treatment,with 90% paying nothing, and surviving on fundraising) Kiama Hospital. Living at Gerringong just after the period of Henry Parkes’s speech was in fact a famous Fenian, John ‘Golden’ Goulding. Here is some of his history, I am sure the Orangemen locally kept a wary eye on him! This is the story of why he became a Fenian. transported for five years, was there when the famous ‘Fremantle Conspiracy’ rescued many prominent Fenians and was freed in 1869 along wiht many others.. Here is his Gerringong story. The Gerringong Museum publish and sell…. “A GERRINGONG FENIAN” The story of John O’Neil GOULDING and the Fenian uprising in Co. Kerry in 1867. John was subsequently transported to Australia on the last convict ship, and is buried in the Gerringong Cemetery. ‘The first Grand Lodge was opened in Sydney in 1845, Pro. Robert Barr being the first Grand Master, and Bro. Andrew Alexander, the Deputy Grand Master. Bro. Alexander was the Grand Master the following year. The institution grew and prospered; No.2 Lodge was opened in 1845, No.3, No.4, and No.5 (in Kiama on the New South Wales South Coast) in 1846. It is significant that the first Orange Grand Master in Australia was Robert Barr, who later published a newspaper (the Kiama Reporter sued into oblivion by Alexander Berry after publishing the famous ‘Shoalhaven Devil’ letter by John Dunmore Lang) and later was the printer for the Kiama Independent ( while running a pro-Orange paper in Sydney). A fascinating catalogue of ritual machines made by the De Moulin Brothers can be found here, including goats to be ridden, shaky bridges and trick chairs, and much more exotic things, mainly as part of rituals of trust while blindfolded, to advance to the next degree of a order. A great set of Orange songs ( Mainly political satire to annoy Catholics) can be found here. The most famous was ‘The Battle of the Boyne’ which would have been a major feature of the Orange marchs held in Kiama each July 12th. (the day of the battle where William of Orange defeated the Catholics). A major feature would have been the unique Lambeg drum only used by Orange marches and orange bunting on shops and cermonial arches across the street . Orangemen’s Day is an official public holiday in Newfoundland and Labrador in Canada on July 12th even today. Another great resource is the book ‘the faithful tribe’ by Ruth Dudley Edwards who gives a fairly sympathetic but quite in depth appraisal of the Loyal Oranges lodges, in light of the Drumcree confrontations over Orange marches in recent years. The Catholics held similiar festivals to celebrate St Patricks Day and it is known the local Catholics in Kiama did not celebrate Empire Day as St Patricks was seen as the national day. Empire day was in fact started in NSW by Sir George Fuller, Premier and Kiama resident who was prominent in Kiama Protestant politics. Tensions clearly arose for example over the railways strike in 1917 which led to the national strike, especially over a court case involving money missing from the Kiama railway office, referenced in the minutes of the Gerringong True Blues. One can only speculate if the the Great Kiama Fire of 1899, which destroyed 26 buildings in Kiama, as part of a pattern of ten fires over five years, was part of these tensions in Kiama! Uploaded by Kilsally. – Check out other Film & TV videos.